He died without finding his lost little brother. 95 years later, a Utah DNA database helped their children finally connect. (Scott Sommerdorf | The Salt Lake Tribune) Pennsylvanian Robert Bob Sweet, left, talks with his new-found Utah cousin Amanda Giles as they gathered for a reunion, Thursday, November 9, 2017. At right, 22 month-old Alec Giles - the youngest member of the family - holds onto his mother's sweater. Recently, the daughter and a few of her siblings decided to do DNA testing on ancestry.com and found a man in Pennsylvania who matched their DNA. 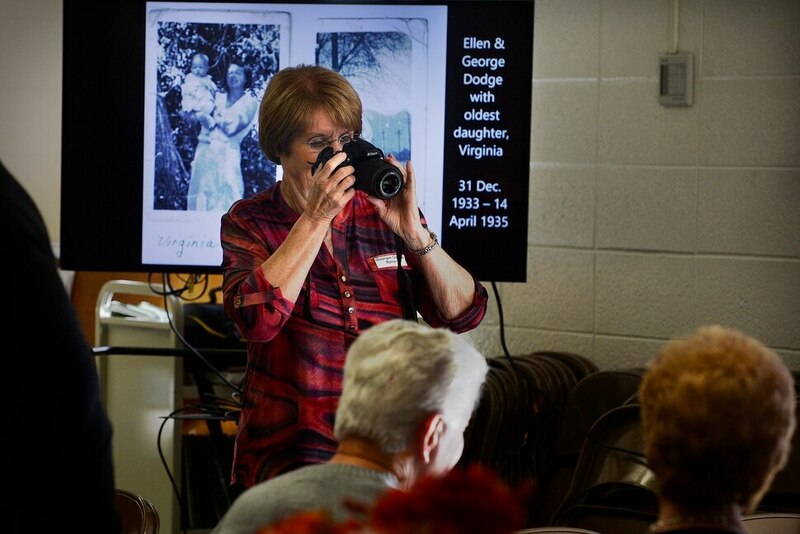 (Scott Sommerdorf | The Salt Lake Tribune) Georgia Dodge Spear makes a new set of family photos as much older ones play on a slide show as Utah and Pennsylvania families gathered for a reunion, Thursday, November 9, 2017 at the Bountiful Tabernacle. 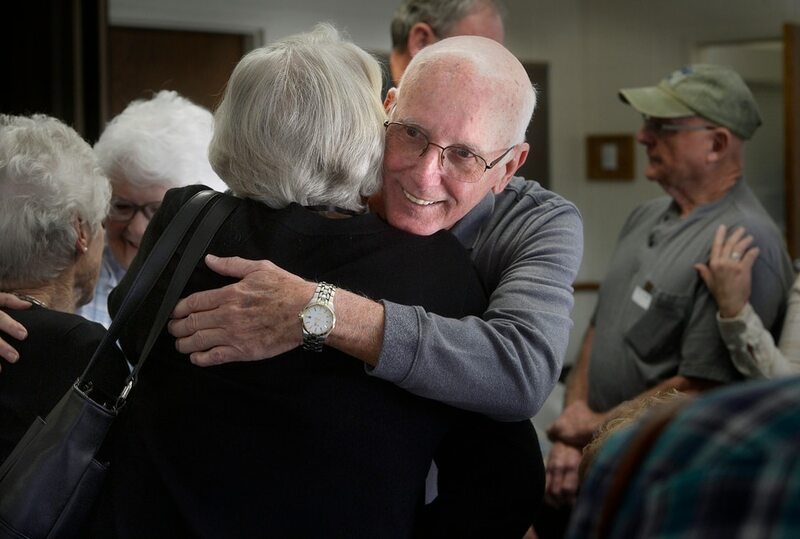 (Scott Sommerdorf | The Salt Lake Tribune) Robert Bob Sweet of Pennsylvania hugs one of his newfound cousins as the families gathered for a reunion, Thursday, November 9, 2017 at the Bountiful Tabernacle. (Scott Sommerdorf | The Salt Lake Tribune) Carol Sperry, left, and Marilyn Dodge Meecham, right, embrace as their families gathered for a reunion, Thursday, November 9, 2017 at the Bountiful Tabernacle. (Scott Sommerdorf | The Salt Lake Tribune) George Arthur Dodge is seen in one of the table centerpieces as the families gathered for a reunion, Thursday, November 9, 2017 at the Bountiful Tabernacle. (Scott Sommerdorf | The Salt Lake Tribune) Doug Shumway and Georgia Dodge Spear present a cake as their families gathered for a reunion, Thursday, November 9, 2017 at the Bountiful Tabernacle. 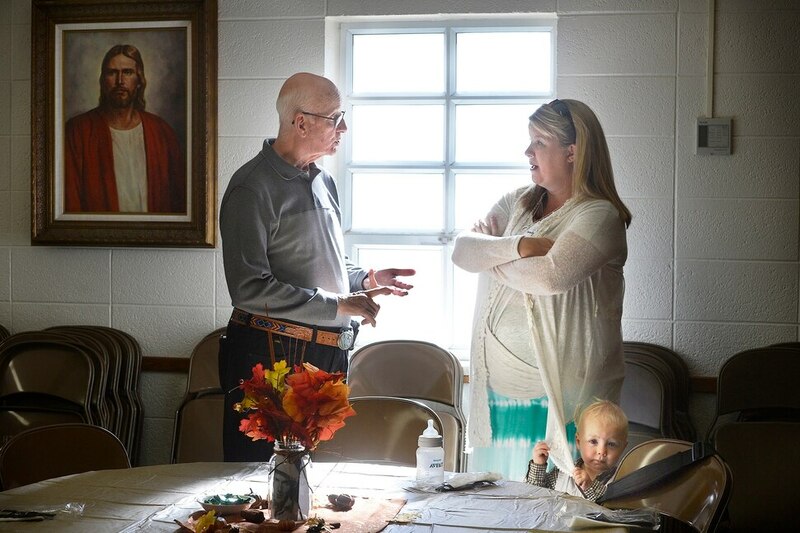 (Scott Sommerdorf | The Salt Lake Tribune) Newfound cousins Jennifer Dodge McLeish and Johnny Dodge, right, speak with Robert Bob Sweet, left, as their families gathered for a reunion, Thursday, November 9, 2017 at the Bountiful Tabernacle. (Scott Sommerdorf | The Salt Lake Tribune) An old family photo of Chester Roy Dodge aka Chester Don Sweet is displayed as part of a slide show playing as newly connected families gathered for a reunion, Thursday, November 9, 2017 at the Bountiful Tabernacle. (Scott Sommerdorf | The Salt Lake Tribune) Family members line up to take lunch as family photos play on a slideshow playing during their reunion at the Bountiful Tabernacle, Thursday, November 9, 2017. (Scott Sommerdorf | The Salt Lake Tribune) Georgia Dodge Spear, left, beams out at a gathering of Utah and Pennsylvania families as they gathered for a reunion in Bountiful, Thursday, November 9, 2017. Bountiful • Chester Sweet thought he was an only child. He didn’t know that when he was born — in 1916, a year before the date he’d been told was his birthday — he had seven older siblings, different parents and a different last name. And he died not knowing that his older brother George Dodge spent a lifetime trying to find him after they were separated from a Salt Lake City orphanage in 1922. Their father, Reuben Dodge, had died in 1916. Mother Agnes Dodge was bedridden with rheumatoid arthritis before she died in 1926. The four oldest Dodge children were old enough to fend for themselves, but the four youngest were placed in the orphanage in 1918. Four years later, when George was 8 and Chester was 5, Chester was given to a foster family. Though there was no official adoption, he never returned to the orphanage. 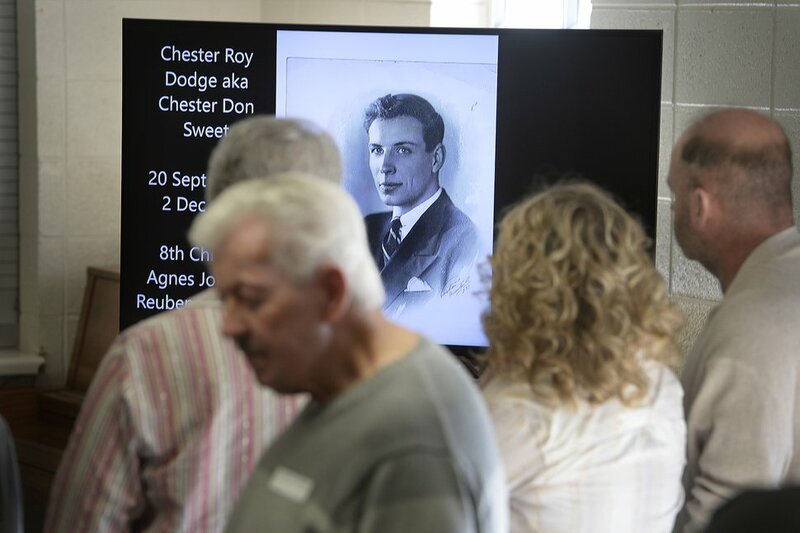 (Scott Sommerdorf | The Salt Lake Tribune) An old family photo of Chester Roy Dodge aka Chester Don Sweet is displayed as part of a slide show playing as newly connected families gathered for a reunion, Thursday, November 9, 2017 at the Bountiful Tabernacle. Burt and Emilia Sweet, the couple that would become Chester’s parents, moved to Pennsylvania and changed Chester’s last name and birthdate. Though their lives went in different directions, the seven other Dodge children stayed in contact. But with no birth certificate or adoption records, George Dodge’s quest to find his little brother was still unfulfilled when he died in 1981. 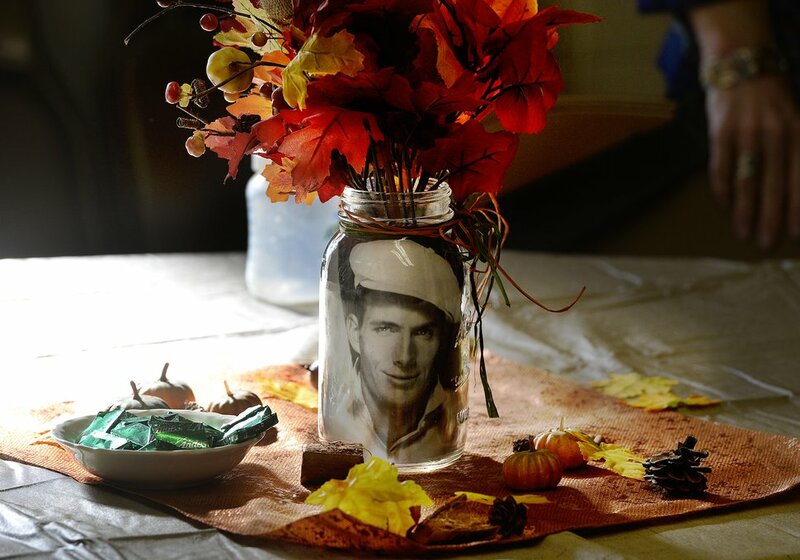 (Scott Sommerdorf | The Salt Lake Tribune) George Arthur Dodge is seen in one of the table centerpieces as the families gathered for a reunion, Thursday, November 9, 2017 at the Bountiful Tabernacle. Then in June, thanks to Ancestry.com’s DNA database, George’s children found a long-lost cousin — and, finally, a link to Chester. “Dad searched for family all of his life,” said Georgia Dodge Spear, another of George’s 10 children. George Dodge rarely spoke of his childhood past the point that his father died. “He was quiet about the orphanage. It was kind of a sad thing for him,” Dodge Mallinson said. George would answer questions his children asked, but he didn’t volunteer information that period of his life — except to say that he wanted to find Chester. Eleven years ago, Dodge Mallinson started researching genealogy, looking everywhere for Chester. She sifted through courthouse records and petitioned judges to open sealed documents. She found a record listing every baby boy born in Salt Lake City the same day as Chester, and called multiple people on the list to try to find a lead. She was finally allowed to see a record book from the orphanage that showed her father and Chester had both lived there — until January 1922, when Chester was taken and the trail went cold. All they knew was that he had existed. Dodge Mallinson and Dodge Spear entered their DNA profile into Ancestry.com, 23AndMe.com and FamilyTree.com two years ago. Dodge Spear’s hopes were beginning to wane. “Over time, you kind of think: ‘Oh, we’re not ever going to find him, or he’s gone,’” she said. (Scott Sommerdorf | The Salt Lake Tribune) Georgia Dodge Spear, left, beams out at a gathering of Utah and Pennsylvania families as they gathered for a reunion in Bountiful, Thursday, November 9, 2017. Robert Sweet was certain he had only one living cousin, on his mother’s side. His father, he believed, had no siblings. He’d attempted to find his father’s birth certificate by making trips to Utah, but couldn’t uncover anything and gave up the pursuit when Chester died at age 81 in 1998. When his cousin decided to fill out her DNA profile on Ancestry.com, she talked him into putting his own profile on the site in June. A month later, Dodge Mallinson logged into her account and saw a notification for a DNA match — another first cousin. “I looked at his tree and there was his dad, Chester Sweet,” she said, still carrying a hint of amazed disbelief. Dodge Spear sent him an email to try to establish contact, including photos and documents that linked their fathers. Robert Sweet was skeptical at first, but similarities in the photos and the irrefutable DNA evidence brought him around. Overnight, he went from having one first cousin to 17. “As things progressed, the family went from a couple to 10, to 20 to 40 to there’s a couple hundred,” he said. Robert Sweet, now 73, and his wife traveled to Utah this week. They met their new Dodge relatives, exchanging lifetimes of stories and visiting the former site of the orphanage that sent their families on diverging paths. (Scott Sommerdorf | The Salt Lake Tribune) Robert "Bob" Sweet of Pennsylvania hugs one of his newfound cousins as the families gathered for a reunion, Thursday, November 9, 2017 at the Bountiful Tabernacle. On Thursday, a group of Dodges and Dodge descendants from all over the West Coast gathered at the Bountiful Tabernacle for lunch. They reminisced over photos of relatives Robert is learning to know, and shared beloved family stories he’s hearing for the first time. Dodge Spear said she can see reflections of her father in Robert Sweet’s eyes and in the corners of his mouth — characteristics and traits that unmistakably define a Dodge family member. She believes her dad and Chester have reunited in the afterlife. The brothers must’ve had something to do with bringing about this reconnection, which they never had the chance to do while alive, she said.